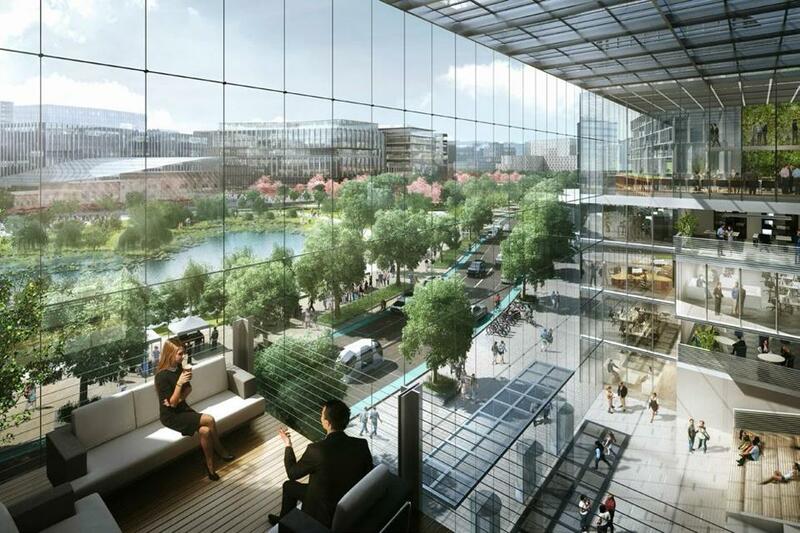 Rendering of Suffolk Downs site from City of Boston Amazon HQ bid. Boston on Thursday submitted its bid in the heated competition for Amazon’s new $5 billion “second headquarters,” a 218-page pitch that leans hard on the region’s intellectual firepower and offers up Suffolk Downs as a site whose ease of development outweighs its distance from the heart of the city. The detailed proposal, complete with two slick videos, outlines the region’s world-class universities and skilled workforce, and casts Boston as a place where the world comes to think through its toughest problems. The bid leads with intellectual Boston’s strengths, city officials said, in the hope that brainpower will carry Boston to the top of an estimated 150 proposals that have poured into the tech giant’s Seattle headquarters this week. While other cities have tried gimmicks to get the company’s attention, Boston’s appeal is its fundamentals, said Mayor Martin J. Walsh. And while some cities have dangled big tax breaks — $500 million from Worcester, $7 billion from New Jersey and the city of Newark — Boston barely mentions them, for now at least. The following is the document sent to Amazon to lure the e-commerce giant to set up its second headquarters in Boston. The bid, filed in partnership in time for Thursday’s deadline with the city of Revere, offers Amazon a spot many Bostonians might consider off the beaten path. 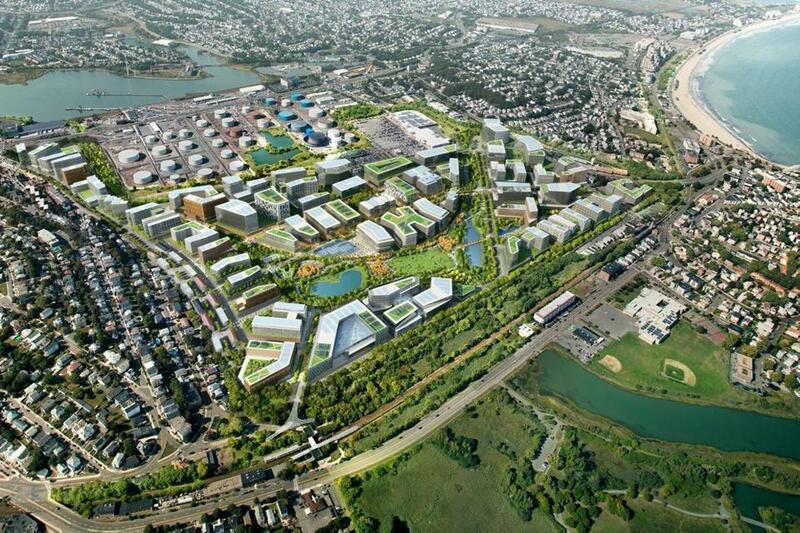 The city focuses heavily on Suffolk Downs, the soon-to-be-closed horse track in East Boston and Revere, devoting 34 pages to detail a vast campus Amazon could build there over the next decade or beyond. Other potential sites around the city receive brief roundups. The focus on one site is a bit of a gamble. Other contenders, such as Chicago and Washington, D.C., have pitched a menu of options, and a wide range of Boston developers pushed sites in recent weeks, hoping to get included in the bid. But city officials say they read Amazon’s request as highly specific — it asked for 100 acres, on transit, ready-to-build — and offered the one site in Boston that clearly fits the bill. Some critics have warned that Suffolk Downs is too generic a site for a city as distinctive as Boston to pitch Amazon, and that its location is too far from downtown, the Seaport, and Kendall Square, where the company already has about 1,000 employees. But supporters note the land has a single owner who has already launched permitting for a large mixed-use campus, and it has lots of room for Amazon to grow. A firm led by former Boston Redevelopment Authority director Tom O’Brien bought the 161-acre property in May for $155 million from a group that had hoped to put a casino there. That makes it a far simpler place for Amazon to build than alternatives with multiple owners, such as the Widett Circle railyard south of downtown Boston or clusters of scattered parcels in the Seaport or downtown, said Armando Carbonell, head of urban planning at the Lincoln Institute of Land Policy in Cambridge. 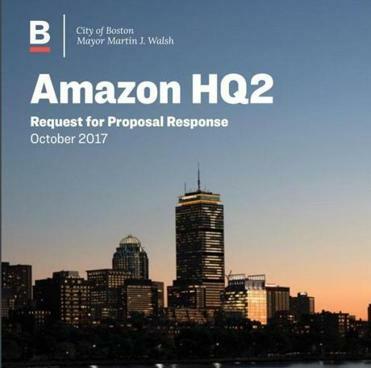 The bid is Boston’s response to Amazon’s request for proposals for a campus to complement its home base in Seattle. The opportunity, which Amazon says could generate 50,000 jobs over 20 years, set off a frenzy among cities eager to win it. Boston is widely considered a strong contender. Amazon is expected to winnow down the many applications to a short list, and make a decision next year. Boston loaded its pitch with data about the region’s workforce and schools, and supportive letters from local universities pledging to partner with Amazon on research and education. There were letters, too, from a slew of Boston-based companies, from giants like General Electric, which moved its own headquarters here from Connecticut, to tech startups that have grown with Boston’s talent. Accompanying the bid was a letter from Governor Charlie Baker that touted the attributes of all Massachusetts, such as the state’s roster of colleges and universities and its innovation economy. Baker’s letter steered clear of highlighting Boston specifically. It reflects his strategy of supporting bids from across the state equally; more than a dozen were expected by Thursday night’s deadline, with sites ranging from a city golf course in New Bedford to a redeveloped South Weymouth Naval Air Station to business parks in the Merrimack Valley and MetroWest. Eventually, though, state support will be key to Boston’s bid. It envisions improvements to Route 1A and harbor ferries to improve access to the Suffolk Downs site, and reviving plans to connect the Blue and Red Lines in downtown Boston to better link East Boston to southern parts of the city and Cambridge. All those things would require state money, and in a competition that has already drawn subsidy offers worth billions of dollars from a few states, Massachusetts may need to dig deeper to land Amazon. Top Walsh aides visited the State House Tuesday to share the bid with at least one key figure: House Speaker Robert DeLeo. The Winthrop Democrat, who has championed Suffolk Downs from the start, said he’s prepared to push a bill through the Legislature to help win Amazon, likely next year. It would focus on transportation funding, he said, such as paying for a long-discussed flyover ramp for Route 1A, but could include other incentives. Mostly, though, the bid accentuates Boston’s assets. A two-minute video highlights the city’s history and culture, and depicts a place of diverse neighborhoods, where “doers” of all kinds come together. There are some who worry that bringing Amazon to Boston could upend the culture of a city that’s already too expensive for many of its residents. Seattle has seen traffic and housing prices surge as Amazon has grown to employ some 40,000 people there. Boston must make sure the same doesn’t happen here, said City Council member Tito Jackson, who is challenging Walsh in November’s mayoral election. “East Boston is already facing a displacement crisis that will only accelerate if Suffolk Downs is transformed,” Jackson said in a statement. “We must put our residents first rather than promise the earth to another large corporation. City officials acknowledge winning Amazon will likely require some sort of tax break, but probably not as much as the “up to $500 million” figure that Worcester included in its pitch. But at this point, Walsh said, it’s too soon to talk specifics. Boston officials will need to see what other contenders propose, and get a clearer sense of what Amazon is looking for. 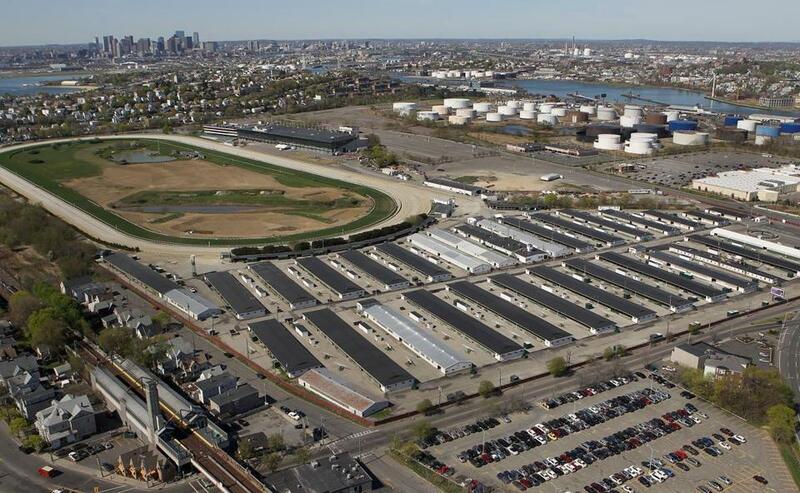 For Amazon, is Suffolk Downs the right fit? Could the Amazon bid finally connect the T’s Red and Blue lines? Correction: This story has been updated to reflect the correct number of pages in the Boston bid devoted to the Suffolk Downs site.